Good Shepherd Preschool has always been fortunate to have a very supportive group of parents. 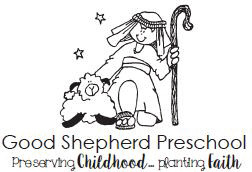 The Good Shepherd Parent Organization works to help raise funds to: supplement special purchases, provide special assemblies and appreciate the GSP teachers. The Good Shepherd Parent Organization meets monthly and all parents of enrolled children are invited to attend. Complimentary on-site child care is available. Being part of the GSPO is a wonderful way to connect other preschool parents and begin a practice of becoming involved in your child’s education.